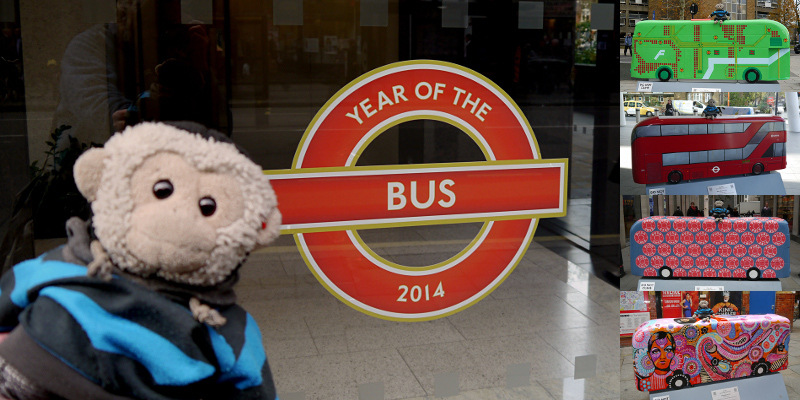 Year of the Bus was a public art event by Transport for London from late 2014 through January 2015 to promote buses in London. 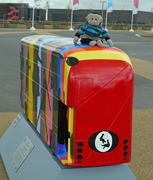 There were 58 New Routemaster bus sculptures scattered around London split into four trails: Central Croydon, Queen Elizabeth Olympic Park, River Thames & City of London, and City of Westminster. 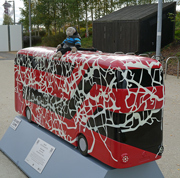 The bus sculptures were auctioned in aid of three charities: Kids Company, Transaid and London Transport Museum. Mooch would like to thank the staff of Stanfords and the London Transport Museum, and also the policeman near Horse Guards who helped his human to stand in the road while taking a photo. But he wants to blow a razzie at the security management of the Whitgift Shopping Centre who objected to having their buses photographed with Mooch on them. Mooch would also like to thank Wild in Art for another fun street art event.